James Cohan is pleased to present the first solo presentation of work by Katie Paterson in New York and the artist’s largest exhibition of work to date in the United States. The show will be on view from September 16 through October 16, 2016 at the gallery’s Lower East Side location. On Sunday, September 18, the gallery will host an artist talk and book signing from 5-6 PM, followed by the opening reception from 6-8 PM, both open to the public. For over a decade, Scottish conceptual artist Katie Paterson has looked to the natural world for inspiration in creating intimate and poetic artworks. Paterson treats her varied subjects – geology, ecology, astronomy, and the nature of time itself - with a scientific and profound curiosity. Paterson collaborates with specialists in different fields of study to conduct rigorous research and experimentation, emphasizing that art and science are not mutually exclusive ways of understanding the enormity of our world. The human understanding of infinite time and space looms large in Paterson’s practice and the works in this exhibition expose the relativity of our perceptions. As evidenced by two new installations, Paterson’s work reveals the actual vastness of the universe by shrinking aspects of it to a fathomable scale. Totality (2016) is a full-room, immersive installation which transforms the gallery into a star-filled microcosm of the galaxy. Paterson began this work by sourcing nearly 10,000 unique images of solar eclipses, ranging from the first extant drawings produced in 1778 to present day telescopic images. 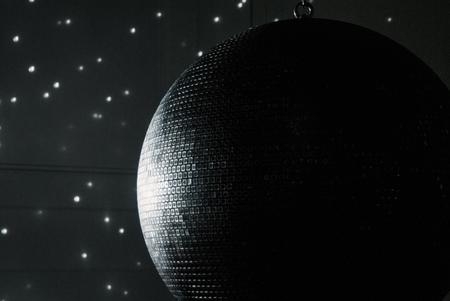 The images are directly printed on each panel of a large disco ball and organized, row by row in the sequence of a full solar eclipse. 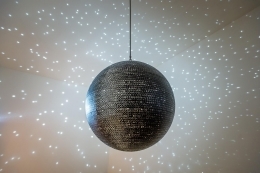 The subtle rotation of the mirror ball mimics a planetary orbit, circulating luminous reflections across the room, across the floor, and across the viewer. People have long viewed the solar eclipse as a mystical experience and Totality inventively recreates this sublime phenomenon through the records of past events. Paterson continues her astronomical investigations with Phoenix (2016), the latest iteration from a series. Phoenix is a string of 92 festoon lights spanning the gallery, each bulb varying in its relative luminosity, recreating the brightness of the constellation’s individual stars. 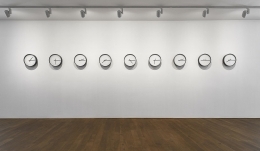 Timepieces (Solar System) (2014) is an installation of nine analogue clocks each representing one of the eight planets and the Earth’s moon. This collection of timepieces reveals the variability of time by showing the length of a day on the different planets in relation to our own clock. A day on Jupiter is eight hours but a day on Venus is 2802 hours. 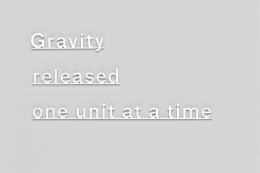 On its most basic level, we experience the passage of time in relation to the sun. Days, weeks, months, years and beyond are divvied up by its inevitable rising and setting. Yet because of this, time is experienced in a dramatically different way even within the solar system – our backyard in terms of galactic distances. In Colour Field, a new and ongoing series, Paterson collaborates with astro-photographers to create photographs of deep space in which the image’s false colors are replace by colors borrowed from our terrestrial world. In the first work from this series, Paterson has produced a large-scale photograph of the Milky Way and infused it with the color-scape of the Los Angeles night sky. 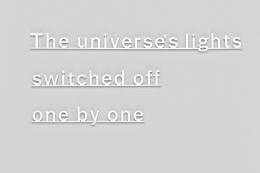 In Candle (from Earth into a Black Hole) (2015), Paterson uses our sense of smell to expand our perception of the cosmos. In this installation a candle burns for a single day, emitting varied and specific odors, creating an olfactory journey through outer space. As observed or imagined, the moon smells of gunpowder, Venus of sulfuric acid, and the scent of a black hole is of disconcerting nothingness. The candle will be burned every Sunday during the course of the exhibition. Paterson’s works often find their genesis in a concise, lyrical phrase. 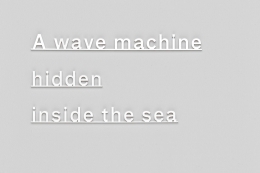 In her ongoing series Ideas, succinct haiku-like fragments such as “A wave machine hidden in the sea” and “The universe’s lights switched off one by one” are presented as a group of waterjet cut silver panels. These works give material form to the core principle of conceptualism inherited from the last century: ideas are art. Paterson’s long-term project Future Library was conceived in 2014 out one of the Ideas. Paterson planted one thousand trees in Norway and throughout the next century, one writer each year will receive a commission to write a text that will be kept in strict secrecy until 2114, at which time these trees will be felled and transformed into one thousand editions of the full anthology. The project will outlive Paterson and nearly every person born before its inception, making it a profound statement of hope in creativity and continuity. Katie Paterson (born 1981, Glasgow, Scotland) received her BA from Edinburgh College of Art in 2004 and her MFA from the Slade School of Fine Art in London in 2007. She is currently the subject of a major solo exhibition at Centre PasquArt in Biel, Switzerland and previously exhibited at FRAC Frache Comté, Besancon, France (2015); Mead Gallery at the University of Warwick, Coventry, UK (2013); Kettle’s Yard at the University of Cambridge, UK (2013); the Modern Art Museum of Fort Worth, TX (2012); BAWAG Contemporary, Vienna, Austria (2012); and Modern Art Oxford, UK (2008). Her work can be found in the collections of the Art Institute of Chicago, IL; the Solomon R. Guggenheim Museum, NY; and the National Galleries of Scotland, Edinburgh, UK, amongst others. 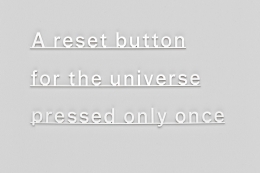 Katie Paterson lives and works in Berlin, Germany. 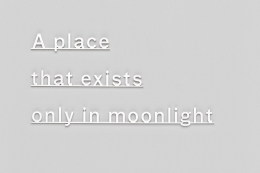 A comprehensive monograph on Katie Paterson’s work will be published by Locus+ and Kerber Verlag in September 2016. For other inquiries, please contact Emily Ruotolo at eruotolo@jamescohan.com or 212.714.9500.